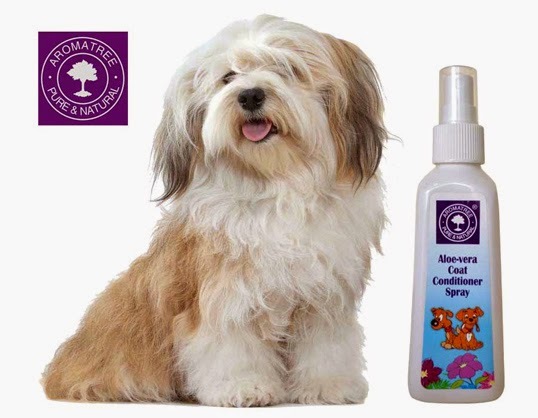 Hold your dog’s untidy or messy hair with Aromatree's Aloe vera Coat Conditioner spray. Aromatree's Dog Coat Conditioner creates, intensifies, and prolongs unparalleled luster and condition of your dog's coat and skin. This light conditioner spray untangles hair, provides a smooth shiny, well groomed appearance and repairs damaged hair. It provides non substantive conditioning and is free from harsh chemicals. It reduces the need for frequent shampoo and visit to a professional groomer. If you are going out with your dog and not happy with looks of your pet, then simply use this spary to give a smooth, silky and shiny texture to your dog’s coat. Aromatree's Aloe vera Coat Conditioner also reduces hair fall and makes hair of your dog stronger and prevents breakage.